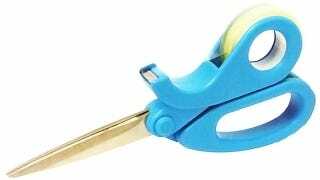 Where Were You Hundreds Of Birthdays and Christmases Ago Tape Scissors? It's obvious why these brilliant scissors with a built-in tape dispenser aren't available in every office supply store in the country. They want you to have to buy both products separately—increasing the store's profits while you sit at home fumbling your way through another botched attempt at wrapping gifts. It's a bigger crime against consumers than Apple's alleged e-book price fixing, but we doubt the US Department of Justice will be filing an antitrust lawsuit anytime soon. So just go buy a pair here for $10 and be thankful the next time you need to wrap a present. And remember, sometimes you have to lose the occasional battle to win the war.